It’s funny…but not. 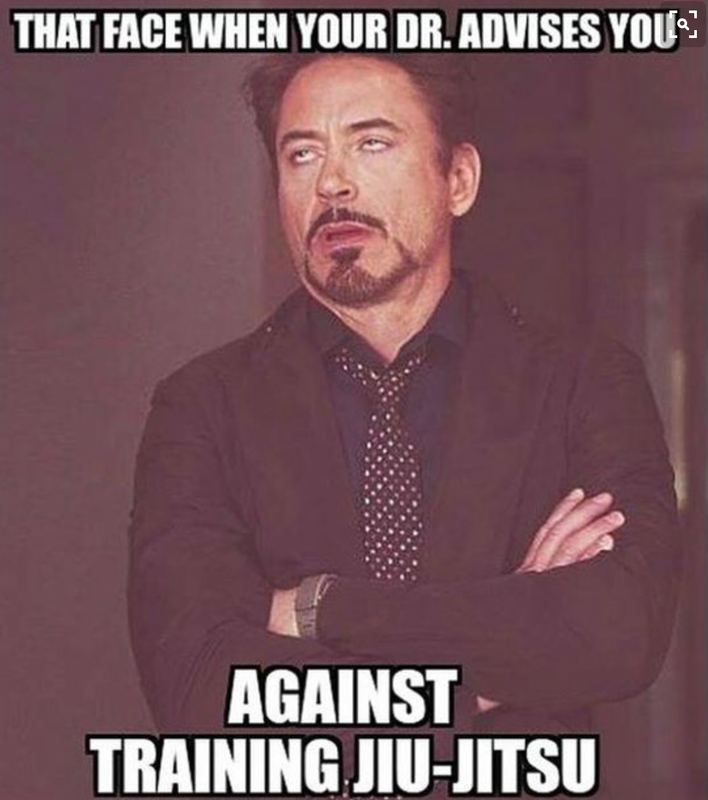 Especially because it isn’t so much the white belt who ends up hurt, but the training partner. It’s absolutely vital that newer students are not only encouraged to slow down, but ASKED to. The first nose fracture I sustained a few months ago wasn’t from a white belt – it was a tough technique, a few parts went awry between us…it happens. But this time it was more the result of over-excitedness, and lack of body control – common to newer students. The message has to come from all of us, though – it has to be engrained from the get-go, because many of our techniques (self defense-based, as much as offensively-based) are designed to injure. 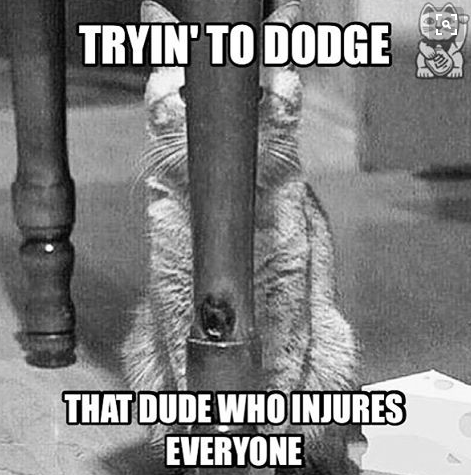 Even when a technique is meant only to control, there is room for an accident – mindfulness makes a HUGE difference in lessening the potential for injury on the mat. I think there’s a misconception that going slowly is a bad thing – it ISN’T. 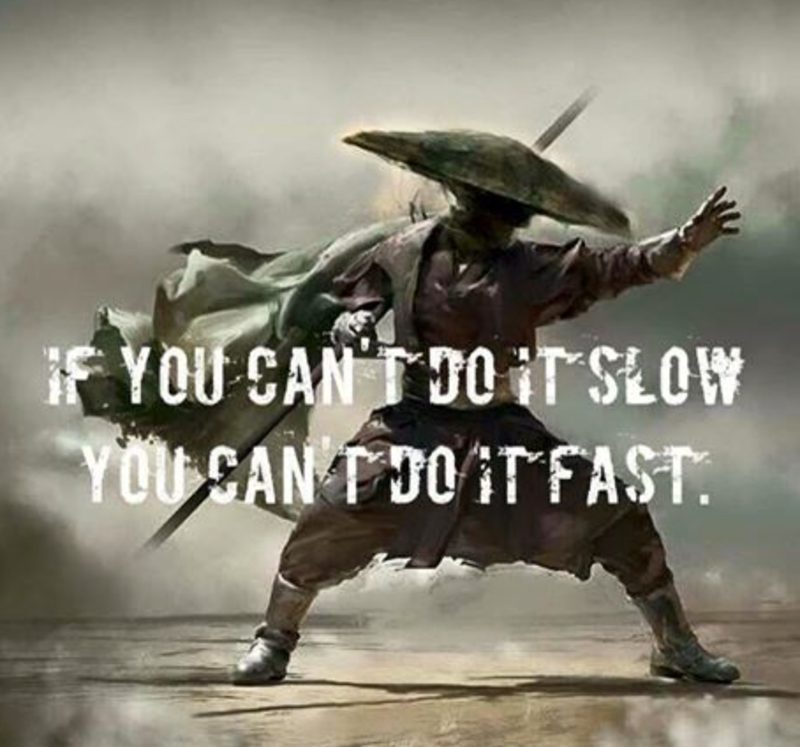 As the saying goes, slow is fast, fast is slow… Being deliberate in the movements builds – first of all – the proper muscle memory. Bad habits are a NIGHTMARE to fix – you want to be drilling the correct mechanics of the technique so, when it matters, that’s how you respond. The other part of that is…you actually CAN hurt the person you are working with. It isn’t a stretch because that is precisely what you are learning to do. If you are more senior, you don’t have to be overbearing – but it is partially your responsibility to guide others when you notice they aren’t as in control as they need to be. 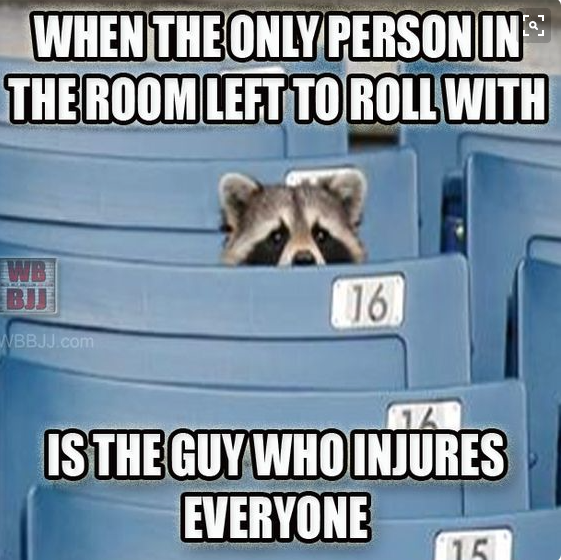 Sometimes even then…accidents occur. So back up your peers if you need to – my friend stepping in was appreciated because while my partner won’t forget she fractured my nose…she was given extra reinforcement from the messages given to her afterwards. It isn’t exactly funny. . .but interesting that there are so many memes about this! I’ve been talking about this a lot lately – I simply have no interest in partnering with students who want to go full-bore. The purpose of my training is to learn techniques, to replicate them properly in order to create the correct muscle memory. 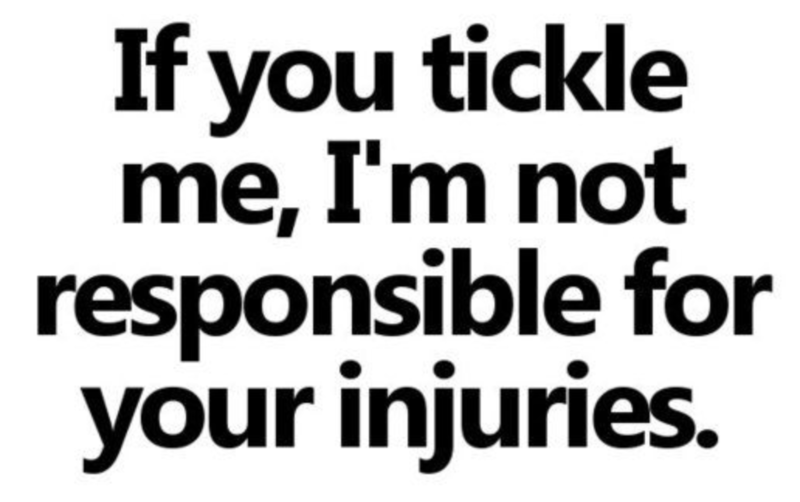 I’m NOT interested in going bananas, and cranking my partner’s limbs…OR my own! 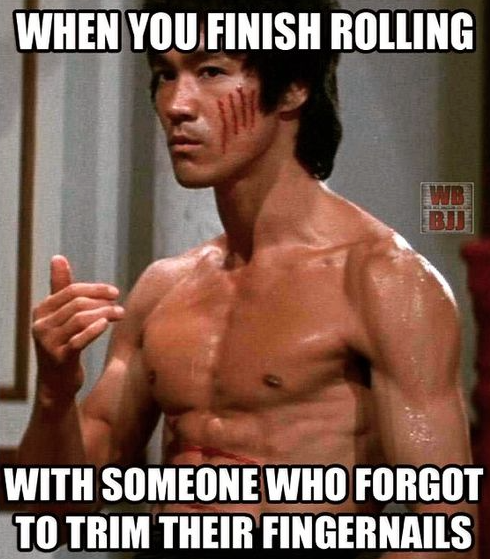 Don’t get me wrong, rolling, kicking, sparring, punching…at your full potential is great too, of course! – but this is more with respect to when we are specifically training techniques. I see (and sadly have FELT) rushing far more than I’d personally like – you can’t go at a snail’s pace for sure, but unless you solidly have the technique, it’s important to be mindful. 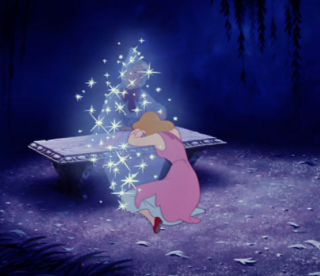 When you are in a class and learning techniques designed not only to lock joints, but flat-out BREAK them, staying in FULL CONTROL of your body and movement is integral. Along with that? Keeping yourself tidy – again, mindfulness – so that you don’t put your partner at unnecessary risk (yes, I have had my face gouged my nails. “Ugh, your DNA is under my nail!” my partner said. My response wasn’t so cheeky, as I wiped the blood off my face.) Cleanliness and grooming matter when you are in a close contact sport. More substantial – avoidable – injuries? NO THANKS! I general dread traditional cardio – I DO it, because I know it’s important. But…it’s a struggle most days! I recently gave myself a lovely bout of plantar fasciitis from running too hard, too fast, too intensely – I woke up the next day and knew EXACTLY what happened. Frustrated I may have been, I knew it was a cue from the grand ol’ Universe telling me to slow down. My feet have been hurting, I’ve been overly exhausted, and frankly. . .I’ve derided cardio even more than normal. Did I take a break? NOPE! So…the Universe HANDED me one. 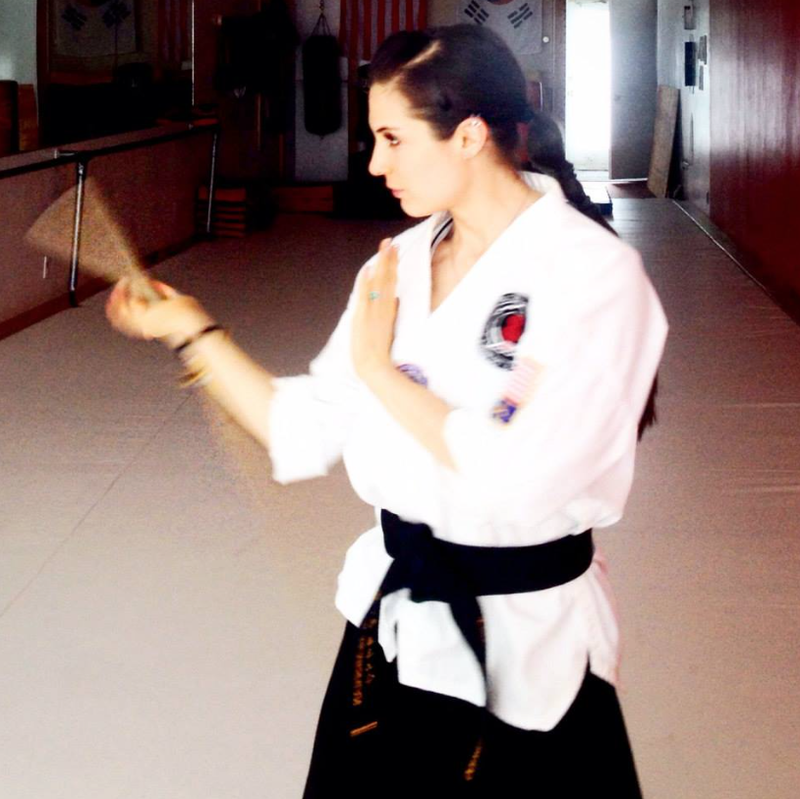 I recently had the good fortune to complete my 2nd Dan promotion in Taekwondo, Hapkido and Kumdo – Our curriculum includes all three Arts, though we focus primarily on the Taekwondo, and Hapkido (both of which I adore!) I hadn’t actually stepped foot in a dojang until my early 30’s – but despite zero background in Martial Arts as a whole, I maintained the belief that anything was achievable. The school I attend is run by the phenomenally accomplished Grandmaster Ik Jo Kang of Korea – not only an 8th Degree Black Belt in Taekwondo, but also a 9th Degree in Hapkido, as well as highly skilled in knife throwing, short stick, long stick, and nunchucks (among other things.) He’s most definitely a force to be reckoned with, and someone I looked up to from day 1. 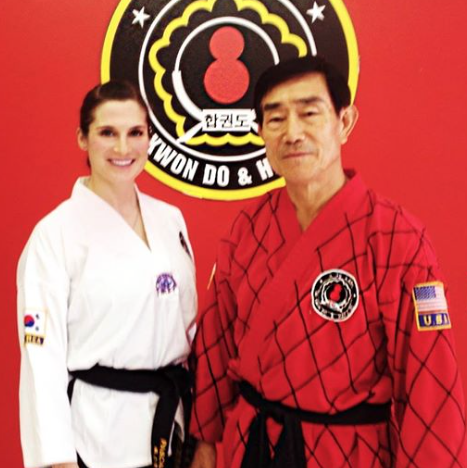 Kwan Jang Nim (the appropriate term for Grandmaster) welcomed me warmly, encouraging me in spite of my very dancelike habits and lack of experience. He generously took me under his wing, and I spent countless private lessons trying to learn as much as I possibly could retain. Most Grandmasters at his level are no longer teaching, not to mention teaching lower belts – we, his students, are very blessed. 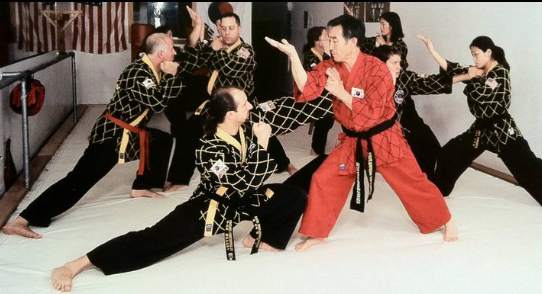 During one of my more intense lessons, in which we practiced nearly and hour of jump kicks and combinations (yung seuk chagi), my foot rolled into a divot in the mat, changing my athletic career in less than a second. As I took off for a spinning, jumping back kick, my knee jolted left to right, severing my ACL (Anterior Cruciate Ligament), tearing the meniscus, tearing the hamstring (at the gastrocnemius tie-in), and severely contusing the bones. Kwan Jang Nim, seeing that I couldn’t move, helped me put pressure to assist with the pain (the hamstring tear was likely the most intense part – popped ACLs cause swelling, but not the dramatic wave of pain I was experiencing. In a fit of cold sweats I tried not to be sick, and to get myself to my feet. I was able to do so within a minute or two but there was something clearly amiss – athletes (of whatever kind!) 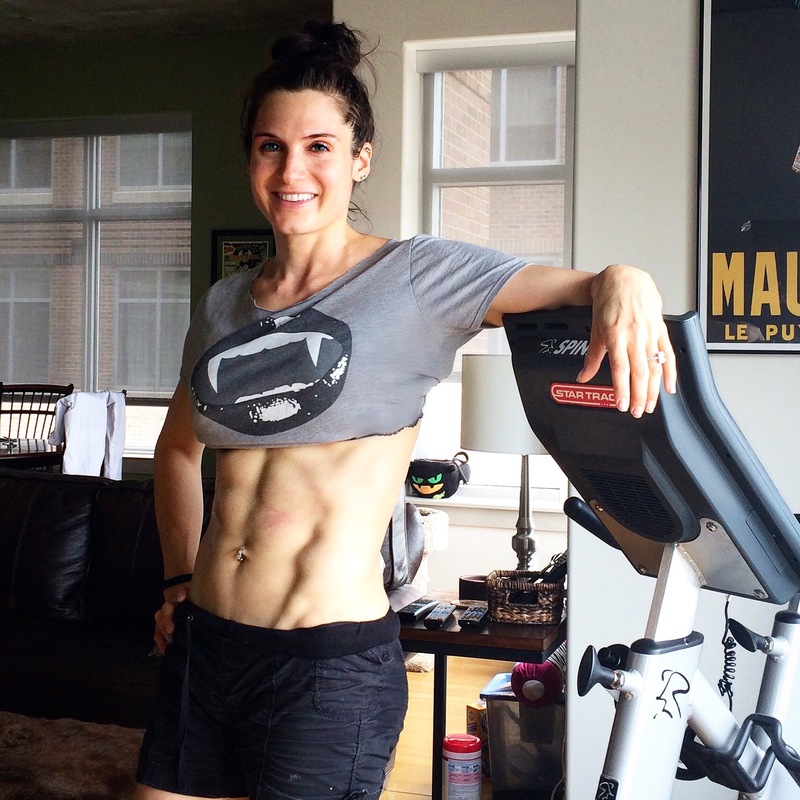 get used to the bumps, bruises, and muscular pain – this was something different. I read the MRI report and burst into tears… Two months prior I had won two titles at the World Championships in ballroom – I was right at a peak age, and ready to revamp my routines and push myself as far as I could go… But in the fell swoop of one, poorly-supported moment…my competitive dreams were taken away. I was in surgery days after receiving the news. The recovery itself was the most painful physical situation I’ve been in, not to mention one of the more trying (though not the worst) on an emotional level as well. My parents are saints for having put up with me – the prospect of not dancing was already devastating, and to know that physical activity was off limits for months did NOT sit well. I lost three inches around my thigh – my quad was actually concave when the swelling subsided – and about eight pounds on that side. Let’s just say it was eye-opening. I remember that I was asked to “fire my quad” and I couldn’t do it. Confused, I looked at my thigh, sending the message to it to contract. Nothing. It was like a dead limb…and it was terrifying. When I spoke to Roger I thought “my God…he wakes up every day knowing it won’t get better… He wakes up and something else doesn’t work, and it won’t come back.” There I was acting like a big baby…and my leg WAS going to heal. That moment stayed with me, and it’s something I think about when I’m feeling down – I am SO blessed. He would smile and tell me to be careful, despite his own circumstance – I will never forget the bravery, nor his ever-present selflessness. He affected me so much that I agreed to do the Tri-State Trek in his honor – we knew his time was limited and I wanted to repay him for the gift of sight and perspective he gave me while he was still with us. 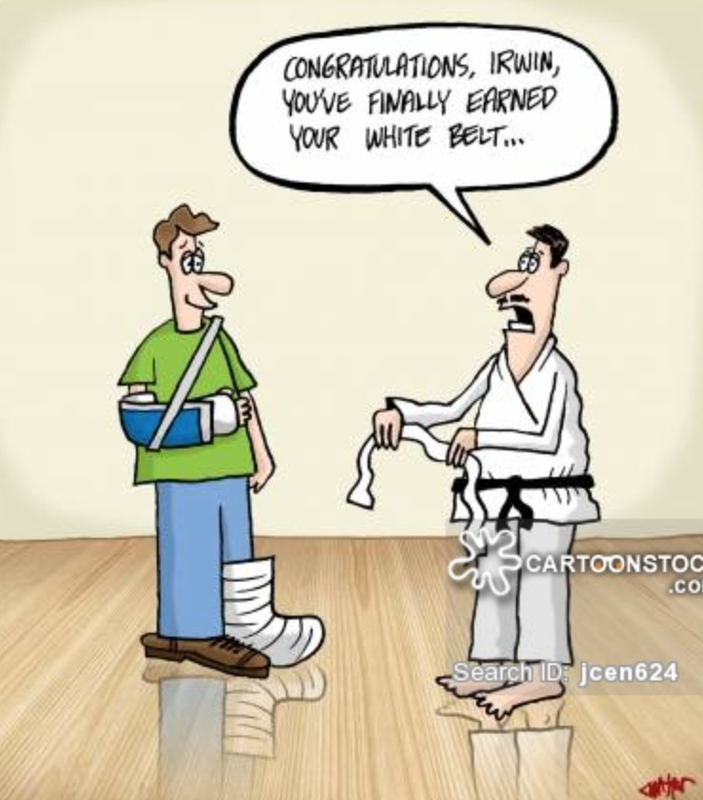 The only aspect of the Black Belt promotion I had some trouble with was snapping a side kick and breaking boards – the emotional paralysis you can sustain from traumatic injury can really stick with you, and it was quite prevalent at that moment! Fortunately, I was permitted to do breaks with my hands. PHEW! The new rank meant the WORLD to me…because it represented my persistence, my perseverance, my dedication… It represented that I could achieve anything I set my heart to – just like the 300 mile bike ride for Roger. After maintaining the rank a while, students were getting excited for the next big promotion. But, while they usually occur at quarterly intervals (maybe more), the schedule shifted dramatically. Kwan Jang Nim was given an opportunity to finally shoot his Screenplay– a long-time dream of his. While we were sad we couldn’t do our promotion, we were incredibly excited for him that his dream was coming to fruition. I stayed in touch with Kwan Jang Nim, eager to hear about any set dates for the testing. I practiced on my own, as I always did back home…but it was so much more important without others to work with me. My hunnie kindly “stole my wallet” many nights as he grilled dinner so I could practice my Hapkido defenses. And I never gave up the hope of getting back home to take my 2nd Degree test. In January I got a call that the promotion was set for early February – I wasn’t sure I could get back for the actual date, so Kwan Jang Nim…very generously…agreed to meet me privately and do my test earlier. FINALLY, the day came, and I was overjoyed. It’s funny because sometimes people assume that getting a belt is something that you just “pay for.” There is a business aspect to many schools that allows for that to occur…but there are a lot of us who work HARD to get where we are. We get their early, do chores we aren’t asked to do, practice on our own. We go to class, ask for feedback, and repeat until we can’t move. Some of us – MOST of us – have had debilitating injuries over the years, and we push through them with determination to reach our goals. It is EARNED, NOT GIVEN for many of us, and there is a lot of sacrifice, blood, sweat and tears along the way. My friends have achieved incredible things – feats I look up to with deep reverence. Overcoming personal setbacks, in particular, is something I have profound respect for – whether emotional, physical or spiritual. For me, this was one of those things… I refused to give up my Arts because I destroyed on knee – it had already taken so much away. I refused to give them up when I tore the second one – my passion never diminished. I have modified, and persisted, and kept my eye on my goal – those two stripes will forever remind me that I have what it takes, no matter what. Having the heart is more than half the battle – never give up on you, or what brings you joy.